Oliver is a smart shin guard that collects real-time data and processes it through an AI algorithm to deliver football-focused insights to players & coaches. Its competitive advantage is the AI software powered by Machine Learning algorithms developed in-house allowing us to deliver football-focused insights (heatmap, kick power, dribbling, ball possession, passes & more). Democratizing data access for every player in the world with no need of cameras, video recognition software or middle-man. Serial entrepreneur with a Marketing & Creativity background. More than 10 years of experience creating and doing things that give me happiness and pride. 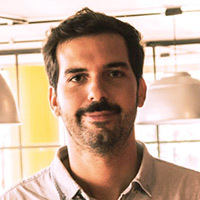 Co-founder, advisory board & former Head of Marketing at Fligoo. 5 years in the sports industry. Big fan of good ideas, good music, and good football.